Colvin & Moggridge » First NHS Framework Agreement project submitted for planning. Colvin & Moggridge have been appointed by the NHS to work in partnership with BMJ Architects on a number of Framework Agreement projects. The first of these projects is a joint venture involving both University College London (UCL) and the Royal National Orthopaedic Hospital (RNOH) NHS Trust. Together they are proposing to build a world-class research and teaching building – the Biomedical Engineering Hub (BEH). The project is currently being considered for planning by London Borough of Harrow and a decision will be made in the next few months with a site start planned for the New Year. The project is part of a wider masterplan for the entire RNOH Stanmore campus, set within the Green Belt, which aims to significantly improve and modernise the hospital facilities. 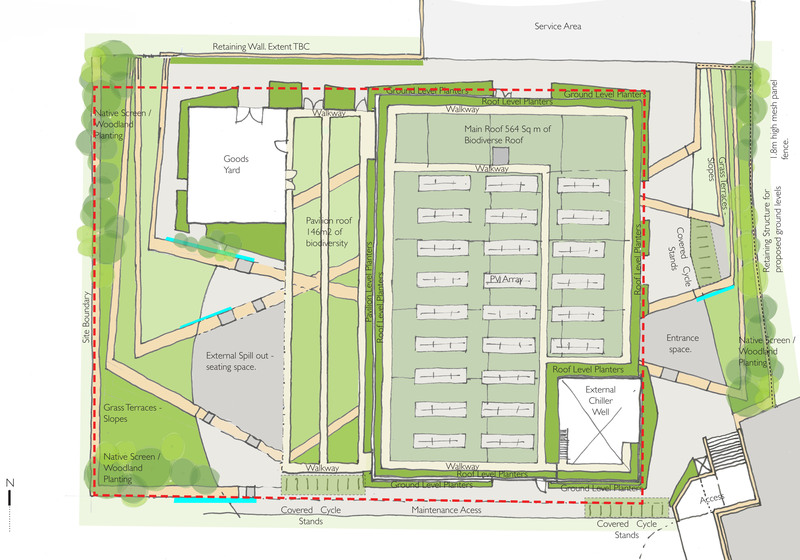 The BEH proposal was designed to meet both biodiversity and sustainability requirements, as well as, fit the wider Stanmore Campus and Green Belt setting. Working closely with the Ecologist and Harrow Biodiversity Action Plan the landscape and ecological management plan uses native climbing plants and trees, species rich wildflower grass and recycled materials to enhance the biodiversity of the site. The building façade will be wrapped in a layer of steel mesh exoskeleton. 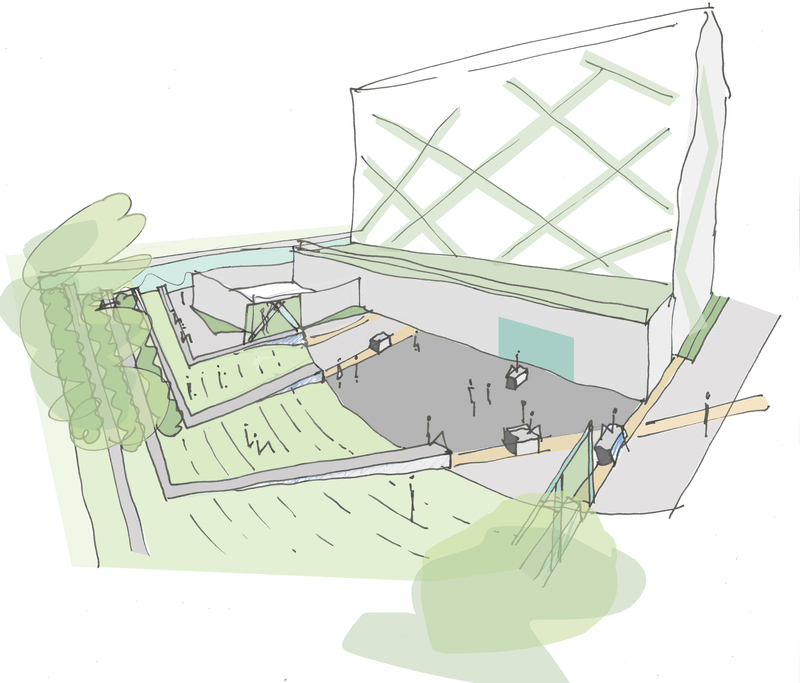 Working with the buildings sustainability agenda, the mesh will act as frame for climbing plants. A mix of Boston Ivy, Virginia Creeper and an evergreen climbing Hydrangea were selected to create both a year-round green wrap and some seasonal variation. The pavilion roof will be a Green Roof contributing to the site’s biodiversity with its Native plant mix. Rainwater will be harvested with water falling onto the Green Roof being drained to the planters below. The rear spill out space will constitute the largest public external space within the BEH application. Grass terraces, reaching almost 4m at their highest point on the Northeast corner, will provide opportunities for seating on the grass slopes. 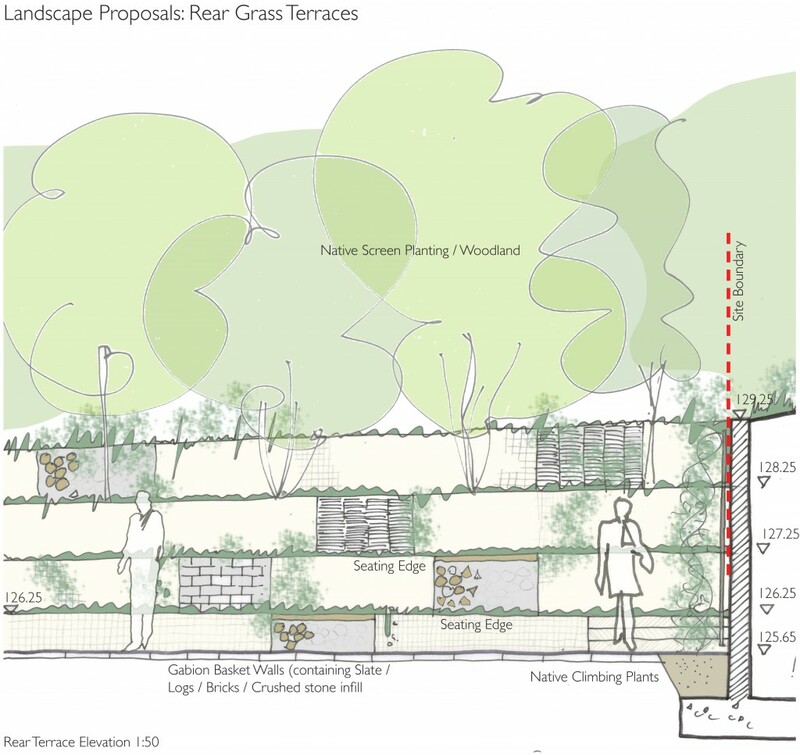 The stepped grass terraces emulate the built form of the building with its mesh façade and wire mesh (gabion) baskets have been proposed as an effective way to reuse a variety of recycled materials, uptake the level difference, incorporate screen planting and provide seating.